Sadler’s Wells’ critically acclaimed international festival of hip hop dance theatre, Breakin’ Convention, is back, with high energy performances from UK and international companies over the May Bank Holiday Weekend (Friday 1 – Monday 4 May 2015). Now in its 12th year, this hugely popular Sadler's Wells production is hosted and curated by pre-eminent UK hip hop theatre artist Jonzi D. Breakin’ Convention showcases the best of international and home-grown hip hop talent and continues to offer a unique platform for young artists, with youth companies being able to present work on the main stage alongside more established acts. This year the 2015 line-up includes three sets of twins; international duo Les Twins, famous for touring the world with superstar Beyoncé; London’s identical b-boy twins Twin Peak; and America’s first generation b-boys The Legendary Twins. Many acts in the 2015 line-up developed work as part of Breakin’ Convention initiatives Open Art Surgery and Back To The Lab. While Breakin’ Convention is an event for the whole family, for the first time this year there will be an adult-only evening of entertainment in the Lilian Baylis Studio, WorX. The evening features titillating tales of desire and temptation through dance, circus and poetry. Featuring live jazz from award-winning alto-saxophonist and MC Soweto Kinch, the evening is hosted by singer, songwriter and poet Floetic Lara. There will be a free cocktail on arrival at this cabaret style event which has a smart dress code and is for strictly over 21s only. Full line-up of acts to be announced shortly. The main festival on Saturday 2 & Sunday 3 May sees Sadler’s Wells’ foyer transformed with live DJs, freestyle dance jams, graffiti exhibitions, workshops from top international artists and live aerosol art. The participatory activities take place pre-show and during the interval. 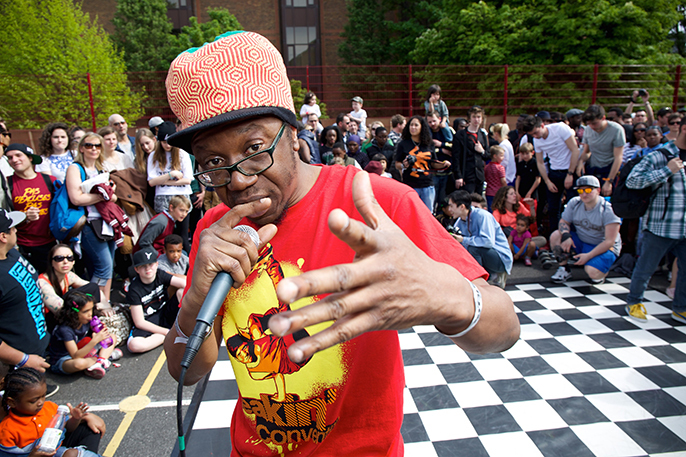 For the third year running Breakin’ Convention goes back to the roots of hip hop on Bank Holiday Monday with Park Jam, an outdoor party suitable for all the family in Spa Fields Park. Boy Blue Entertainment – East London's leading street dance crew featuring choreography from Kenrick 'H2O' Sandy. This company comes from a lineage of Boy Blue Entertainment youth dance development, and performed at Breakin’ Convention last year. Buckness Personified – One of London's leading krump crew returns to Breakin' Convention with a new piece choreographed by Duwane Taylor and Claire Hough. GOP – Patience James and Fumy Opeyemi explore an energetic blend of n'dombolo, azonto and powerful Afro-funk styles. GOP have been at the forefront of the emerging Afro house dance scene in London. This is their first time performing at Breakin’ Convention. Jade and Shango – Mixing lindy hop with modern hip hop, Jade and Shango present a period piece set in America around the time of the assassination of Martin Luther King Jr.
Protocol Dance Company – Formed in 2008 by choreographers Jared Garfield and Lanre Malaolu, Protocol's foundation of movement stems from a wide range of styles such as hip hop, popping and krump. An intense exploration of masculinity, the work sits on the knife edge between mischievous playtime and aggressive initiation. Protocol Dance Company explore power shifts within dynamic krump duets. Developed at Breakin’ Convention’s Open Art Surgery and recently seen at Resolution! 2015 at The Place, London. Saran Kohli – Choreographer and fashion designer Saran Kohli approaches Queen's Bohemian Rhapsody with a slick, witty, street dance routine. Soul Footwork Collective – A collective of dancers from across the UK featuring work choreographed by Wanted Posse and Serial Stepperz' Mamson. The Company – Lee Griffiths leads a collective of krump dancers exploring the male perspective within a woman's world, an abstract piece based upon the text of Isabel Allende. Twin Peak – Identical b-boy twins Jay and Perry of Rain Crew work together for the first time on a piece which explores the conflict between the ego and the inner self. The pair have also danced with Boy Blue Entertainment. Developed at Breakin’ Convention’s Open Art Surgery. Unity – Festival regulars known for their rugged, synchronised 'Unistyle' ensemble choreography, this is a stripped down Unity expressing what happens when boundaries push back. Developed at Breakin’ Convention’s Back To The Lab. Antoinette Gomis (France) – An original member of the sassy Zamounda crew premieres a brand new solo featuring music by Nina Simone and incorporating waacking and house dance. Gator (Cie Philippe Almedia) (France) – Well known on the battle circuit, current reigning UK B-Boy Championships popper, Gator has previously performed at Breakin' Convention with Pro Phenomen. A powerful presence on stage, Gator performs the solo Explicit. Gianna G (Australia) – A delicate fusion of balletic lines and isolated popping techniques, Australian performer Gianna G presents her multi-style approach with aplomb. Flockey (Germany) – This cool and charismatic locker has won numerous battles including the final of annual dance competition Juste Debout in 2011. His style echoes the funky footwork of James Brown. Iron Skulls (Spain) – Navigating an apocalyptic world merging b-boy and contemporary language, Iron Skulls explore a place where humans and animals become one. Sinestesia won 1st prize at Festival HOP in Barcelona. Les Twins (France) – The idiosyncratic style of these French superstars has been seen by millions around the world touring with Beyoncé and Missy Elliott. These identical twins from the northern Paris suburb of Sarcelles excel in new style hip hop and freestyle. Breakin’ Convention marks Les Twins UK premiere. Lloyd's Company (Netherlands) – Lloyd Marengo returns after his successful Breakin' Convention premiere last year with Don't Hit Mama. Tag features b-boys Rabbani Sayed and Xisco Riboch who speak to each other through sparse, intricate breaking technique. Sigh (France/UK) – A mesmerising duet taking influence from Japanese kabuki, new style hip hop and lunar infatuation. Developed at Breakin’ Convention’s Open Art Surgery. The Ruggeds (Netherlands) – Formerly known as Rugged Solution, this eight strong crew from Eindhoven won the UK B-Boy Championships world final last year. The Ruggeds perform Adrenaline, a world premiere. The Legendary Twins (USA) – First generation b-boys who danced at DJ Kool Herc's Bronx parties in the early 70s and are credited as the first dance crew to go down to the floor with footwork and vertical moves. Breakin' Convention presents The Twins’ European premiere. In addition to the main stage acts, there will be performances in Sadler’s Wells’ Lilian Baylis Studio by six UK acts. Berkavitch and Ed Spoons – Is it a boy or a girl? A collaboration between Ghetlow Pirates' b-boy Ed Spoons and one of Leicester's most respected spoken word artists, the duo display a touching and humourous look at the preparation prior to fatherhood. Developed at Breakin’ Convention’s Back To The Lab. Cindy Claes – A woman must choose between love and romance or her personal career goals. A solo piece using dancehall, hip hop and krump styles that raises questions about the status of romance in society today. Myself UK Dance Company – Kloe Dean's all-female hip hop dance company examines female identity and acceptance with a seamless blend of movement and spoken word. Developed at Breakin’ Convention’s Back To The Lab. Realitie – A troubled teenager reveals hidden scars during a therapy session. 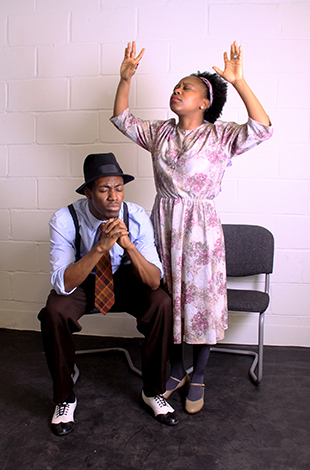 This hard-hitting spoken word theatre piece looks at broken relations in a broken household. Developed at Breakin’ Convention’s Open Art Surgery. The Rebirth Network – Rebirth presents a latent spirituality in its emotionally charged work about the psychological struggle of an individual, prising his fragmented identities onstage via dancers sporadic choreographic phrases. Developed at Breakin’ Convention’s Open Art Surgery. Xena Gusthart – A sensitively performed spoken word and movement piece about relationships between siblings, love, guilt, blame, and deferred responsibility. The work was originally developed at Breakin’ Convention’s Open Art Surgery. Info: Breakin' Convention 2015 is at Sadler's Wells from 1-4 May 2015 | Book tickets | Check www.breakinconvention.com for further updates.